Click here to read chapter one online now! Desire to be a “cowboy actor” and riding the range. Brief stint as a hobo. Reception of the gift of the Scriptures in his life. Bible school days as a student and as a Professor. Two week courtship and marriage to his beloved Dorothy lasting over 60 years. Affect of Alexander Dowie’s ministry on his life. Trials and confrontations faced for believing the Word. Ability to quote from any chapter and verse in the Bible. Nickname of “the walking Bible” and why. Teaching from his Bible Chart, and so much more. Leon Bible, attended Trinity College of the Bible and is a graduate of Erskine Theological Seminary. He serves as Pastor of Gospel Tabernacle, a thriving interracial and interdenominational church in South Carolina. 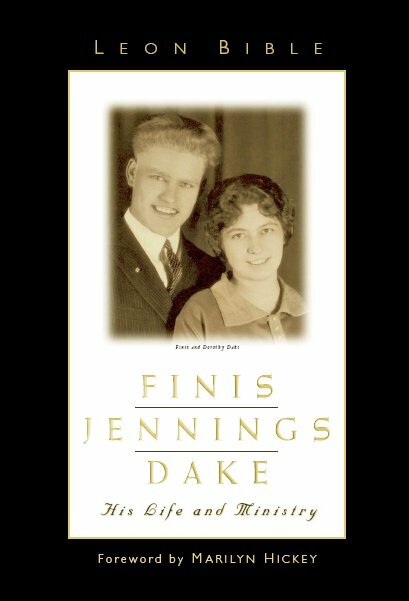 He ministers as a Bible teacher, Author, Historical Researcher, and a Dake scholar – well qualified to write the life story of Finis J. Dake. He is the author of Finis J Dake's Annotated Bibliography: The Sources Used in His Collective Writings; Bible Basics for Spirit-filled Believers; and the popular series: Tithe and Offering Scriptures. He has also contributed to God’s Plan for Man and The Dake Annotated Reference Bible, both published by Dake Publishing. Dimensions: (Length x Width x Height): 9.25" x 6.25" x 1.25"